This sounds a lot like what Solomon wrote in today’s passage! Nearly identical, really. And look at what we have been discussing for the past two weeks. Paul summed it up rather succinctly. Thanks be to God that, though we live in a fallen world and are ourselves messed up, Jesus has made a way and cleaned us of our sin, has given us the promise of the inheritance He shares with His own, adopted through His blood. Do you know what BOGO means? It stands for “Buy One Get One” free. My wife and I have argued for years what is the better way of going; buying one at regular price and getting a second for free or just buying one and only paying half price. 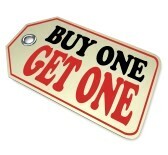 I am sure that every one will agree with me that “two for the price of one” is a much better deal! But not in the case of Proverbs 17:20! Our verse not only talks about a “froward heart” but it also mentions a “perverse tongue”. It goes on to state that these will lead to no good and mischief. Do these definitions sound like someone you know? Do these definitions sound like you? Solomon is telling us that neither of these are good character traits to have and neither of them will end well. This is one more reason why we need to make Proverbs 4:23 a priority in our lives. Lord, I pray that You would help us to guard our hearts will all diligence and keep our eyes focused on you. Help us to guard our hearts and to keep our tongues as we should. Keep us striving to be more and more like You!